2The numbers in the parentheses refer to the number of electoral votes a candidate would have if he won all the states ranked up to that state. If, for example, Dukakis had won all the states up to and including Michigan, he would have gained 280 electoral votes. Dukakis's numbers are only totaled through the states he would have needed in order to get to 270. In those cases, Dukakis's number is on the left in italics and Bush's is on the right. 3Just five of West Virginia's electoral votes were cast for Dukakis. The final electoral vote was cast for Democratic vice presidential nominee, Lloyd Bentsen. For this exercise, the sixth electoral vote is counted as being in favor of the Democratic ticket in terms of the electoral vote allocation in table above. 4Michigan is the state where Bush crossed the 270 electoral vote threshold to win the presidential election. That line is referred to as the victory line. 1) To reiterate a point from the previous post, it is also worth noting that some cycle-to-cycle shuffling of states has to do with the idiosyncrasies of any given election. Too much, then, should not be drawn from the shifts over time. ...not yet anyway. Stay tuned for subsequent updates for a more robust picture. 2) Michigan was again the tipping point state in 1988. Instead of taking a nearly 20% shift toward the Democrats to swing the election -- as was the case in 1984 -- it would have taken an approximately 8% swing in Dukakis's direction to shift enough states/electoral votes and just cross the victory threshold. 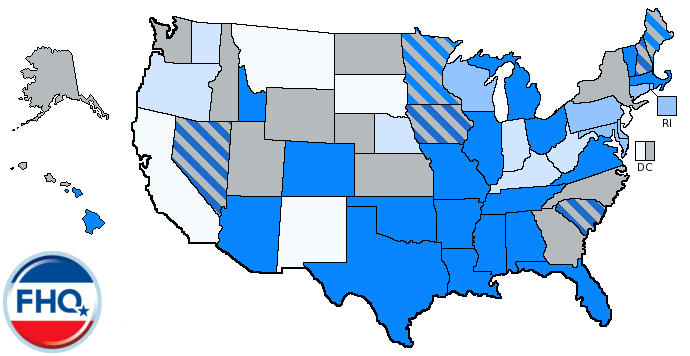 3) The 2012 toss up states are again all over the map. Notably, New Hampshire, Florida and Nevada are deep into Republican territory. Virginia and North Carolina are less so. Ohio continued to cluster around, but not immediately next to, the tipping point of the electoral college majority. On the other hand, Iowa and Pennsylvania persisted in being further to the right of the tipping point, though the Keystone state remained (slightly) Republican. Colorado is also closer to the tipping point in 1988 than was the case in 1984. 4) Other notable states include West Virginia and Tennessee. The Mountain state in 1988 remains an oddity when compared to 2012. It was even deeper into the Democratic column in 1988 than in 1984. The 1988-2012 shift on the spectrum is a net 40 positions. Tennessee, in 1984, was the only southern state to the left of the tipping point. The entire south -- including the Volunteer state -- was not only to the right of the tipping point, but was greater than 10% in Bush's favor. 5) Compared to 1984, 1988 was more competitive. There were 12 states that were within five points. However, just the states with an over 10% margin for Bush got the (at the time) vice president within 12 electoral votes of 270. And even if Dukakis had won all of the toss up states he still would have come up 33 electoral votes short of 270. Bush was working with a cushion in 1988 that was similar to but much greater than the cushion of states Obama enjoyed in 2008. The Death of the Ames Straw Poll? This is part of something bigger that FHQ is working on, but we will roll it out piece by piece starting with 1984. 2The numbers in the parentheses refer to the number of electoral votes a candidate would have if he won all the states ranked up to that state. If, for example, Mondale had won all the states up to and including Michigan, he would have gained 275 electoral votes. Mondale's numbers are only totaled through the states he would have needed in order to get to 270. In those cases, Mondale's number is on the left in italics and Reagan's is on the right. 3Michigan is the state where Reagan crossed the 270 electoral vote threshold to win the presidential election. That line is referred to as the victory line. 1) The colors are fun to look at here if only to see what an essentially spectrumless spectrum looks like in an electoral college and popular vote landslide. But they (the colors) are far less consequential in the grand scheme of this exercise than the ordering of the states. 2) It is also worth noting that some cycle-to-cycle shuffling of states has to do with the idiosyncrasies of any given election. Too much, then, should not be drawn from the shifts over time. ...not yet anyway. Stay tuned for subsequent updates for a more robust picture. 3) Notice where the tipping point state (Michigan) is. In 1984 that was slightly further left -- five spots -- than in 2012; in the second column instead of middle (third) column. The rightward shift indicates that the concentration of population and thus electoral votes has shifted toward the right (into the west and south) due to reapportionment but also because of some shuffling of states. 4) Check out where the 2012 swing states are. New Hampshire and Nevada are all the way over in the column to the far right. Colorado, Florida and Virginia, too, are further to the right of the tipping point. Iowa and Pennsylvania, on the other hand, are further to the left of Michigan. Ohio, surprisingly or not, is huddled up against the tipping point state. 5) Still overwhelmingly red -- owing to the advantage President Reagan held in the electoral college in 1984 -- West Virginia has shifted in the three decades since all the way from the far left column to the far right column of the spectrum. If rankings are assigned, the Mountain state shifted from the tenth slot in 1984 to the 47th position in 2012! FHQ has thrown a bit of a Twitter temper tantrum over the last few days in response to all this grossly premature talk about tearing down the Ames Straw Poll. For the record, I have no attachment to the quadrennial fundraiser Iowa Republicans hold in the year before a presidential election year. FHQ is indifferent to the exercise itself. What we are not indifferent to is the continued misperception of impact/role of the straw poll. Sure, the National Review can cart out the tired and useless straw men like the fact that Ames is rarely predictive of the eventual nominee. Maybe some in Iowa operate under the illusion that the straw poll, or the subsequent (and consequential) caucuses for that matter, are or will be predictors of the outcome of the full nomination race. But that has never been the intent of either exercise. To the extent that either is accurate in forecasting the nominee is typically a function of an existent consensus within the party behind one candidate. The hope, then, may be to be predictive, but the reality in the case of the straw poll and the caucuses is far different. Both are winnowing contests, paring down the choice set for voters in contests in New Hampshire and Nevada and South Carolina and every other state. This is the role of any campaign event that takes place in the invisible primary. "The governor instead wants to have events that strengthen the caucuses, NOT weaken them," Albrecht continued, adding "Democrats don't have a straw poll, and they have had all their candidates participate in the last two contested caucuses. Republicans can't say the same." Let's examine this in a different fashion. Scapegoating the Ames Straw Poll after 2012 is like blaming a microphone for a bad congressional town hall meeting. Ames, like open mikes at all those healthcare town hall meetings that took place during the summer 2009 congressional recess, only amplifies extant feelings/partisanship/ideology/consensus within the caucus-going electorate (or within the broader electorate in the case of the town hall meetings). The candidates don't stay away from Iowa because of Ames or the microphone. The candidates know full well that isn't the problem. The problem is one of strategy. No candidate who is viewed as more moderate compared to the full set of candidates is going to invest heavily in a contest where they are likely to lose on ideological grounds. They are outside of the "mainstream" of most (or a plurality of) caucusgoers in Iowa. Candidates in that situation -- let's call them John McCain or Mitt Romney -- make minimal investments, hope for the best and focus more heavily instead on other states. That has nothing to do with the straw poll. It has everything to do with the electorate and strategy relative to the likely outcome (in the straw poll or caucuses) given that electorate. Those making a premature mountain out of the molehill that is Ames, need to sit back, stop misdiagnosing the problem and wait until 2015, like Republican Party of Iowa chair, AJ Spiker said, when decisions will be made concerning the straw poll. One thing that has not been touched by the press in all of this ballyhoo over Ames is the extent to which the Republican Party of Iowa is still dominated by Ron Paul supporters after 2012. The complaints are coming from outside of the organized party infrastructure. It could be that this is not a story about Ames so much as it is a story about politics within the broader Republican Party of Iowa. Spiker and other Ron Paul supporters within the party apparatus will be up for reelection again before 2015, and it may be that those on the outside looking in on those positions would be better served organizing to defeat those folks rather than attempting to rectify the Ames non-problem. Stated differently, this Ames non-problem is a problem but not because of the injurious impact it may have in 2016. Rather, it is an issue to the governor and others in Iowa because of who would be in charge of the process. These are all really good questions that should be asked of those suddenly calling for an end to the straw poll. A better one would be whether all of the complaints are a function of or a nod to a feeling that those Ron Paul folks can't be beaten and will control any straw poll in 2015. That's the true fear. ...and yeah, that might actually keep a great many candidates not named Rand Paul away in August 2015. But again, folks, that isn't an Ames problem. That is a political problem within the broader Republican Party of Iowa; one similar to but distinct from the discussion about the direction of the Republican Party at the national level. Here we are a little less than three years away -- a long time in politics -- from the likely August 2015 Ames Straw Poll; an event that is often heralded as the beginning of the Republican presidential nomination process. Of course, the real beginning of the 2016 Republican presidential nomination process was sometime either late on November 6 or in the wee hours of the morning of November 7 when the 2012 election was called for Barack Obama. Never the less, many look upon the late summer event in Iowa in the year immediately prior to a presidential election year as important; a point at which people are actually casting ballots for would-be/actually-are candidates in the state that quadrennially kicks off the new primary season. Non-binding on the actual nomination race or not, some -- Governor Terry Branstad (R-IA) -- are now calling for an end to the process. It is a little early to be talking about death knells for 2016 campaign events. As Republican Party of Iowa Chairman AJ Spiker rightfully pointed out, Branstad will not be the one making this decision. The 2016 Republican nomination race is wide open from our vantage point here in November 2012. It may not be in 2015 (but probably will be to some extent). Calling for or forecasting the end to events in Iowa is an age-old past time in the political sphere. There are probably other reasons too, but let's focus on these interrelated four. At least during the 2012 cycle folks waited until February 2011 to start questioning the utility of the Iowa caucuses. Built on the same house of cards reasoning -- that social conservative Iowa Republicans would select someone who was too conservative to do well in the remaining primaries and caucuses and by extension the general election -- some continued to question Iowa's usefulness at the beginning of the Republican nomination process after Michele Bachmann won the 2011 straw poll. That reasoning is predicated on the false notion that these events -- whether the straw poll or the first in the nation caucuses -- have to be or should be predictive of the final outcome. This is the wrong way to think about the role of either event. Both the straw poll and the caucuses due to their positioning are not predictive events. They are winnowing events. Sometimes the stars align and the straw poll and more often the caucuses crown (or as luck would have it, "pick") the nominee.1 But that is not always the case. And it doesn't have to be. Leave the picking to other states. Iowa's power has always been in winnowing the choice set. The only real, definitive bit of information that we have to have at this point in 2012 about the future of the Ames Straw Poll is that the Republican Party of Iowa is not going to unilaterally disarm.2 That is certainly true given the discussions of who may run on the Republican side in 2016. There continue to be discussions about how deep the Republican bench is and if that comes to fruition -- if Rubio, Bush, Christie, Jindal, Ryan and Paul all run or even if half of them run -- then Iowa Republicans are not going to discontinue the straw poll. Well, the party would not end the straw poll unless there was clear evidence that all of the candidates, especially the big name candidates, would skip the event. Even then, the party may persist with the straw poll. But that scenario isn't likely to happen because if all or half of those candidates listed above run, it will only take one opting into the straw poll process -- as is or tweaked in some way, shape or form -- to bring the others in. The Ames Straw Poll is or would be too big of a deal to miss from an organizational standpoint. 2016 is not shaping up to be a John McCain (2008) or Mitt Romney (2012) sort of cycle for the Republicans; a cycle where a seemingly more moderate candidate is the frontrunner -- nominal or otherwise.3 Unless all of the above pass on 2016 for some strange reason, then all will be motivated to participate in the straw poll. That is more true in light of the fact that there does not seem to be a true social conservative on the short list of candidates. In Ben Domenech's taxonomy, Rubio (or Bush) is the establishment candidate, Jindal is the populist, Christie is the moderate and Rand Paul is the libertarian. That leaves room for one dark horse, who could be a social conservative, but absent such a candidate, all of the others would have some selling to do to the social conservative Iowa crowd. That portion of the caucusgoing electorate would matter, but would likely be split to varying degrees unless one of the candidates emerged or had emerged prior to the straw poll as a clear frontrunner. The bottom line is that, yes, like Craig Robinson, I agree that the candidates will be the ones deciding the future of Ames Straw Poll. If they show up, it matters. If they don't, then it won't. But depending on how the eternity that is the next two and a half years of the invisible primary progresses, there will likely be incentives for the candidates to throw their hat in the ring. That comes with some consequences -- a poor showing could mean lights out -- but the reward of meeting or exceeding expectations could be greater than that risk of not. It's just too early folks. Call me in late 2014 to discuss the death of Ames. November 2012 is too early. 1 Much of this has to do with the extent to which a consensus frontrunner has emerged by the time of either the straw poll or the caucuses. If that consensus exists as it did in 2000, for instance, then the majority/plurality of Iowa caucusgoers often make the pragmatic choice whether it overlaps completely with their ideological position or not. 2 Terry Branstad might want to discontinue the practice, but the RPI does not and will not. 3 Another way of thinking about this is that there was 1) no clear frontrunner and 2) the overall field was viewed as weak in both cycles. Both factors seem to have applied in 2012, but neither seems to fit the conditions of 2008. FHQ will have much more on this later, but we wanted to get the final results through the lens of our map and the Electoral College Spectrum up before too much time passed. 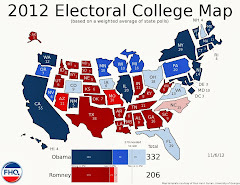 1Follow the link for a detailed explanation on how to read the Electoral College Spectrum. 2The numbers in the parentheses refer to the number of electoral votes a candidate would have if he won all the states ranked prior to that state. If, for example, Romney had won all the states up to and including Colorado (all Obama's toss up states), he would have gained 275 electoral votes. Romney's numbers are only totaled through the states he would have needed in order to get to 270. In those cases, Obama's number is on the left and Romney's is on the right in italics. 3Colorado is the state where Obama crossed the 270 electoral vote threshold to win the presidential election. That line is referred to as the victory line. This is the first part in a two part look at how FHQ's weighted average stacked up in examining the 2012 electoral college. We'll first take a global look at FHQ in the context of the other models out there. Part two will take a micro view of the FHQ model in relation to the electoral college results. 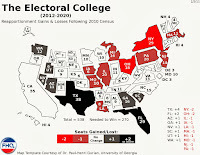 Now that we are nearly a week removed from the re-election of President Obama, FHQ thought it would circle back around and take a look back at how we did in examining the state of play within the electoral college. The answer is not too bad. What was 49 out of 51 correct state-level projections based on our simple weighted average in 2008 morphed into a perfect 51 out of 51 score in 2012. FHQ was not alone. Drew Linzer (Emory) at Votamatic and Simon Jackman (Stanford) blogging for the Huffington Post and Sam Wang (Princeton) at the Princeton Election Consortium all were either right on or in Wang's case cautiously calling a tie in Florida. [And truth be told, Florida was a tie, but one that consistently -- around FHQ anyway -- ever so slightly favored the president. Again, we're talking about a decreasing fraction of a point as election day approached.] Oh, and Nate Silver of FiveThirtyEight fame pegged it at 332-206, too. This was a great thing for the so-called "quants". Despite that, there are a couple of notes that are floating around out there and are worth mentioning. 1) FHQ won't take any victory laps because of this.1 Don't get me wrong. It is nice to be a dart and not, say, the board itself, but this actually has very little to do with what FHQ was doing under the hood -- or what any of the above folks were doing, for that matter. If we were all making sausage, then FHQ and the others were merely turning the crank on our various sausage making apparati. The filling -- the polls -- was what really nailed the election projection on the state level.2 Drew first published his model in June. FHQ followed in July. The polls, even through our different lenses. told the story then. 332-206. Over the course of the summer and into the fall, that changed very little. For FHQ, Florida got as close as 0.04 points in favor of the president, but then took a turn back toward Obama. That was it. The Sunshine state was always the only state that ever truly threatened to jump what FHQ calls the partisan line into the Romney group of states. The polls were not only right on the money, but they were overall, pretty consistent. Jim Campbell's argument/observation that the September polls are a better predictor of November election outcomes came to pass. What we got in October was just noise before state-level polling reverted or began reverting to those post-convention, pre-October numbers. As FHQ asked throughout October, were we witnessing a movement toward Romney in the polls or the typical sort of narrowing (Campbell 2008) that tends to mark the late campaign polls. The latter may not have been the true answer but it was closer than simply talking about Romney's momentum. Tom Holbrook's (1996) equilibrium theory of candidate support through the polls seems to have been the correct lens through which to view the dynamics of the race as election day drew nearer. Score this one for the polls, then. 2) But where does that leave the models? After all, the sausage maker has some utility, too. Well, FHQ's natural inclination is to piggyback on the above point and state the obvious. The polls were right on and you didn't really need a statistical model -- complex or otherwise -- to accurately project the electoral college. In true self-deprecating fashion (Bear with me. I'll get there.) -- something FHQ is good at -- our little ol' weighted average was accurate enough to get all but two states right in 2008 and every last one in 2012. Again, it was the polls. In fact, if you removed the weighting and took the raw average of all the publicly available polls released on and before election day in all of 2012 you would come up with the same thing: 332-206. 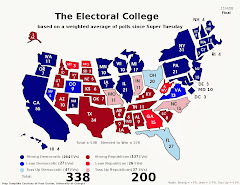 As I told Drew over the summer in a brief Twitter exchange, my hope was at that point just after the conventions that the race would tighten up so that we could, in fact, get a true measure of the utility of the more complex statistical models projecting the electoral college. As it stood then -- and how it ended up even with some narrowing -- there was a lot of overlap between the Bayesian models and the more pedestrian averages. Mind you, I'm not saying that there is no place for these models. Boy, is there. I'm with John Sides on this one: The more models we have, the better off we all are on this sort of thing. Rather, my point is to suggest that the simple averages are a decent baseline. As November 6 approached and the FHQ numbers did not budge in the face of changing information following the Denver debate, I began to think of the FHQ weighted average like the Gary Jacobson measure of congressional candidate quality. Now sure, there have been herculean efforts littering the political science literature to construct multi-point indices of candidate quality, but they don't often perform all that better than Jacobson's simple test. "Has challenger/candidate X held elective office?" That simple, binary variable explains most of the variation in the levels of success that various candidates -- whether challenging an incumbent or vying for an open seat -- have enjoyed across a great number of elections. The multi-point indices only slightly improve the explanatory power. The tie that binds all of these models -- if you really want to call the pre-algebra that FHQ does a model -- is a reliance on polling. And that raises a different question as we shift from reviewing 2012 to looking at 2016 and beyond. The quants "won" this one. But it was not without a wide-ranging -- and fruitful, I think -- discussion about the accuracy of polling. The one question that will continue to be worth asking is whether the seemingly perpetually dropping rates of response to public opinion polls continue to drop and what impact that will have. If that continues, then there would almost certainly have to be a tipping point where phone-based polls begin to more consistently miss the mark. The good news moving forward is that the online polls -- whether YouGov, or Google Consumer Surveys or Angus-Reid -- performed quite well in 2012; offering a ray of hope for something beyond phone polls in a time when cell phones are hard to reach and landlines are disappearing. The bottom line remains: these projections are only as good as the polling that serves as the sausage filling. If garbage goes in, then garbage is more likely to come out. On the other hand, if the polling is accurate, then so too are the projections. 1 I won't take any victory laps, but I will extend to all of those who have been both loyal and happenstance readers alike a very sincere thank you for spending some or all of election season with us. And yeah, that stretches back to late 2010. Thank you. 2 This is something Harry Enten of the Guardian mentioned via Twitter on Saturday and AAOPR more or less confirmed today. 3 One factor that should be noted here that may separate FHQ from the more involved models is polling variability. 2008 was witness to a great deal of polling variability. The margins in that open seat presidential election jumped around quite a bit more than in 2012 when an incumbent was involved. 2016, in some respects is shaping up as a repeat of 2008. That is even more true if both Hillary Clinton and Joe Biden pass on runs for the Democratic nomination. Both races would be -- at least from our vantage point here three years out -- wide open and influence the polling that is conducted across firms and across states. Yet, even with that unique situation, FHQ lagged just one correctly predicted state -- North Carolina -- behind FiveThirtyEight. No, no one wants to talk about this right now. But yeah, it is happening. Jon Bernstein, I thought, summed it up quite well this morning. But his focus was on the jockeying among candidates and the press coverage of the slow-moving, behind-the-scenes process that will take place before the 2016 primaries get underway. That's the candidate/press/party networks side.1 There is also a parties side; more specifically a parties rules side. That, too, should be mentioned. And that, too, has been going on for a while now. History will show that Mitt Romney -- or the surrogates acting on his part at the convention at which Romney was the nominee -- had one large impact on the presidential election process: They rewrote the rules under which Republican Party candidates get nominated to be the Grand Old Party's standard bearer in the general election. That Republicans did that so far in advance was a function of, well, the rules. The 2008 Rules of the Republican Party called for the rules for the next cycle -- 2016 -- to be set at the 2012 convention in Tampa. Plus, the Democrats, too, have to set their rules. That process will begin in the spring of next year and continue into 2014. Additionally, FHQ will be in Washington for the National Association of Secretaries of State meeting in January alongside of which will be another meeting of the National Presidential Caucus group that was assembled in Cambridge back in May. 1 Jon rightly points out in the comments section below that he was also referring to party networks in his post. Indeed he was. That is a point of differentiation that I did not make clearly enough (networks vs. rules -- and the obvious endogenous relationship between the two) above. 12:30am: Waiting on speeches from the candidates and "537 votes close" Florida to wrap this thing up. 11:16pm: Networks start calling Ohio for Obama. That's all folks. 11:04pm: North Carolina held out this long. As I said earlier, the longer the Tarheel state played out -- no matter who won -- the better it would be for the president. 11:00pm: California, Hawaii and Washington are all Obama states as we hit the West Coast. Idaho is Romney territory. 10:50pm: Minnesota to Obama. Another Lean Obama domino falls toward the president. 10:42pm: Arizona to Romney according to NBC. Montana has moved that way too. New Mexico is blue. 10:00pm: And Utah slips into the Romney column. 9:52pm: New Hampshire to Obama. The path is squeezing down to nothing. 9:39pm: Pennsylvania is also big. The paths to 270 are increasing for Obama; decreasing for Romney. Romney is going to need to carry North Carolina, Florida, Virginia, Ohio and either Iowa or Colorado to take this. 9:31pm: Wisconsin to Obama is a biggie. 9:00pm: That Michigan call is pretty big. Kansas, Louisiana, Mississippi, Nebraska, North Dakota, South Dakota and Texas all are in for Romney. New York, New Jersey, and Michigan all go to Obama. 8:31pm: Arkansas and Tennessee move into the Republican column. 8:00pm: Connecticut, Delaware, DC, Illinois Maryland, Massachusetts, Maine (3) and Rhode Island all go to Obama at the 8pm hour. Oklahoma goes to Romney. Obama 64, Romney 40. 7:41pm: South Carolina to Romney. Romney 33, Obama 3. 7:30pm: West Virginia is in Romney's column as the 7:30 states close. I'll take this opportunity to remind everyone that it was just a few cycles ago that the Mountain state was reliably Democratic. 7:23pm: Indiana to Romney. My, what a difference four year makes. Regression to the mean in the Hoosier state. 7:02pm: Kentucky to Romney. Vermont to Obama. Just like four years ago. ...and every year before that. Oh no, not another one of these guides. Yeah, I know. They're a dime a dozen at this point. However, FHQ did want to reiterate a point we made recently. Call it a one state guide to the early part of election night. This one hinges on how things go in the early going in North Carolina. The Tarheel state is a state that Mitt Romney should win. That isn't what this concerns. Instead, we should be looking at how early and how comfortable the networks are in calling North Carolina. If a call is able to made early and it is a 2-3 point margin for Romney, then the governor may be overperforming the polls there and perhaps -- perhaps -- elsewhere. But there are two other possibilities that if we extrapolate from the North Caroline situation, could have implications. If Romney outperforms the polls by more than 5 points and a call is made very early/quickly in the Tarheel state, then we may have some early evidence that there is in fact a tide behind the Republican candidate. If, however, North Carolina drags out into the night in a manner approaching what happened in the state four years ago, then that may alternatively bode well for the president. No, this is not a definitive guide. And yes, FHQ is well aware of the fact that idiosyncrasies within one state may prevent generalizing to other states. It is also true that the campaigns have both backed off just a little in the last week here in the Old North state. Yet, North Carolina is something of an early signal in this presidential election. Obviously, Virginia closes its polls early too and there may be indications there as well. But Virginia is a little more competitive than North Carolina and likely won't be able to be called as quickly. Election day is here, and here is how things look at FHQ. The election day map ends up just about right where it started out in July. Michigan shifted over those four months from Toss Up Obama to Lean Obama but always hovered around the line between those two categories. Indiana, Montana and Tennessee all started off in the Lean Romney category, drifted upward into the Strong Romney area throughout the late summer and early fall. That puts all three in line with where they would have been if we assumed a uniform shift in support toward the Republicans since the 2008 cycle. The margin in Missouri also moved up, but the Show Me state pushed from Toss Up Romney to Lean Romney after the conventions. Now, focusing on category changes masks some underlying movement that we should also mention. It is true that in all the toss up states with the exception of the lone state tipped in Romney's favor -- North Carolina -- that the margins drew closer as election day approached. Within the course of the campaign, some attributed this to the post-Denver momentum Romney enjoyed. To be sure, that debate altered the micro-dynamics of the race. But that effect dissipated in the polling over time and gave way to the typical narrowing that is exhibited in post-convention polling. [2008 is an exception to that rule.] FHQ says micro-dynamics there because the macro-dynamics -- the "fundamentals" -- still seemingly and ever so slightly "helped" the president. ...or at least that is what has been reflected in the polls. Despite their tendency to meander due to events on the ground, the polls have told a consistent story through the lens of the FHQ weighted averages. The tally is now where it was in July: Obama 332, Romney 206. Now, it should be noted that the average margin (see table below) in Florida is down to just 0.16. That is pretty close, folks. FHQ will keep Florida right where it is on the map (The average does still tip to the president. ), but the Sunshine state seems like a 50/50 proposition as election day makes its way into the afternoon. We could just as easily see a 303-236 split -- which is what many others are predicting -- but only time will tell. On the Obama side of the partisan line, New Jersey and Maine switched spots, but are basically occupying the same space. As for the Romney side of things, Indiana and South Carolina traded places, Louisiana jumped up a handful of spots on the strength of some dated polls being added to the mix today and Texas and West Virginia exchanged slots. Again, there isn't that much to the discussion of states that are done in the eyes of most folks. FHQ mentioned Florida above, but beyond the Sunshine state, Colorado and Virginia seem to be the best opportunities for Romney (again, given the polling data we have) today. Does that mean Romney will be unable to push the partisan line deeper into the states colored in light blue or even those in primary blue? No, it absolutely does not. However, the odds are not in the former Massachusetts governor's favor to pull that off. The final FHQ weighted averages in the 32 states with late-entry data are below. The remainder were already in the clubhouse so to speak or were never, in the case of states like Delaware and Mississippi -- polled in 2012. If you haven't already voted early, go vote today.